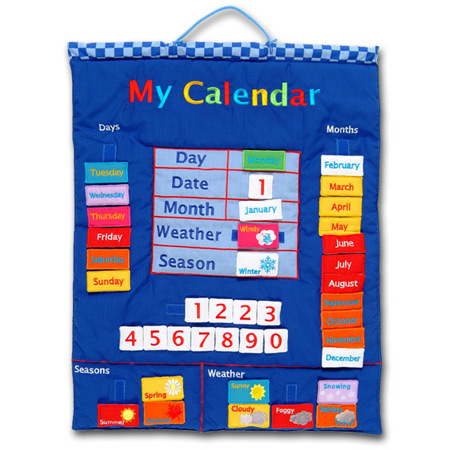 My Calendar soft fabric wall hanging range from Fiesta are fabulous for helping children learn about days, dates and months. They also make splendid wall decorations to brighten up bedroom, playroom or classroom. Popular with adults too, Fiestas Wall Hangings can often be found as a proud centrepiece in the kitchen. Every morning, children delight in changing the embroidered date pieces and are particularly raring to peer out of the window to give their forecast using the illustrated colour coded pieces in the special Weather section. Both the main wall hanging and moveable pieces are embroidered and stuffed giving them a charming soft-toy cushiony feel. A continuing best-seller for over 20 years, Fiestas fabric calendars bring warmth and joy wherever they are placed. And they are long-lasting too, becoming a family heirloom many families have had their charts for many years; each child has grown up with this in their bedroom. And spares are available from Fiestas website just in case a piece gets lost!